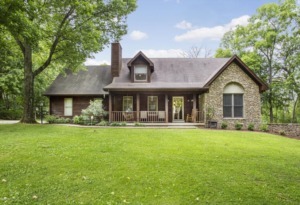 Incredible 3BR, 3BA cedar home nestled on 5 private gorgeous acres in Waddy, KY! This amazing home in Shelby County will blow you away with it's stunning park-like setting. Tucked back off the road, this home offers unbelievable peace and serenity. Once you step inside the home you'll love the warmth of the rich fireplace and the hardwood floors here in the great room. The kitchen boasts amazing space and offers plenty of cabinet and counter space! You'll love the first floor master and the fantastic space it offers! Upstairs there's still more space with the generous bedrooms and bathroom! Charmind details and architecture. Outback you'll love the backyard and the privacy found here. Melt away your stress from the private views on the back deck! Click to schedule your showing.